The summer capital of British India then and present day Himachal Pradesh, Shimla is the famous hill station of Northern India. 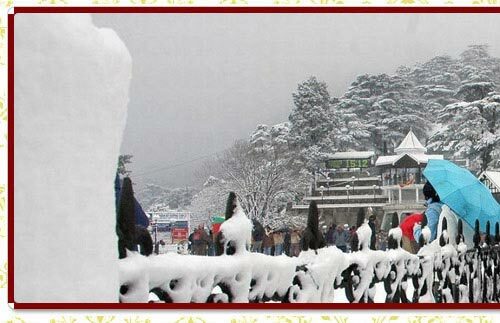 Located in the north-west Himalayas at 2205 metres above sea level, Shimla is much more than a Mall Road. The amazing scenery offers a poised beauty to enthrall every visitor. The heavenly bliss at Shimla also attracts honeymooners, who find a place not better than Shimla to begin a new blissful life. Main Attractions : The Viceregal Lodge, Mall Road, The Ridge. Geographic : Located in the foot hills of the North-west Himalayas is the old summer capital of the British, Shimla, a city full of colonial charm. Famous for: The summer capital of the British Empire, Shimla is currently India's most favored hill resort. By Air : Shimla's Airport is located 23 kms south at Jubbarhatti. By Road : Delhi - 10 hours, Manali - 11 hours. By Railways : : Shimla is connected by narrow gauge, on which runs the famous Toy train, through the town of Kalka. Located in the north-west Himalayas at an average altitude of 2,205 metres, Shimla formerly known as Simla, is the capital city of Himachal Pradesh & a popular tourist destination. Often referred to as the "Queen of Hills" when it was declared the summer capital of the British Raj, Shimla is an anglicized version of the word Shyamala, a reference to the goddess Shyamala Devi, an incarnation of the Hindu Goddess Kali. The city is also famous for its buildings dating from the colonial era, which exude a unique charm of their very own. 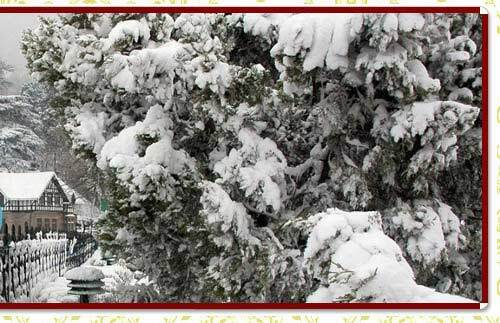 The bustle, charm & unique beauty of Shimla can be captured as part of Shimla city tour. Built on the Observatory Hill, one of the seven hills that Shimla is built upon, as a home for Lord Dufferin, Viceroy of India from, it housed all subsequent viceroys and governors general of India. The building, with a splendid & royal aura, was host to many historic decisions during the Indian independence movement, such as the Simla Conference, held in 1945, where the decision to carve out Pakistan and East Pakistan from India was taken. After independence, the building was renamed Rashtrapati Niwas and used as a summer retreat for the President of India. However, subsequently, it was turned into a centre of higher learning. The central street in Shimla, a part of Shimla tourism, was constructed during the British colonial rule, with offices of Municipal Corporation, fire service, and police headquarters located here. To preserve the amazing ambience of the road, automobiles, except emergency vehicles are not allowed on this road providing locals and tourists a great opportunity to stroll & take in the beauty of Shimla. The Mall road is lined with a number of showrooms along with the emporium of Himachal government that offers handicraft products of Himachal Pradesh such as woollen cloths, pottery and indigenous jewellary. The Ridge is a large open space, located in the heart of Shimla, running east to west alongside the Mall Road which has several picturesque colonial buildings attached to it such as an old neo-Gothic church dating to 1844. The Ridge road has adjoining it the famous Lakkar Bazaar, a wooden crafts market while it also has beneath it a large water reservoir which acts as the main supply of Shimla town.